Thanks for visiting Magic Car Wash & Detail. 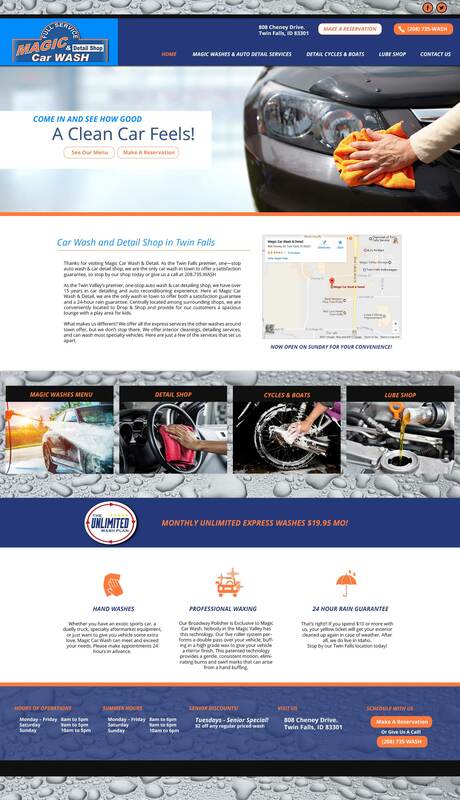 As the Twin Falls premier, one—stop auto wash & car detail shop, we are the only car wash in town to offer a satisfaction guarantee, so stop by our shop today or give us a call at 208.735.WASH As the Twin Valley’s premier, one-stop auto wash & car detailing shop, we have over 15 years in car detailing and auto reconditioning experience. Here at Magic Car Wash & Detail, we are the only wash in town to offer both a satisfaction guarantee and a 24-hour rain guarantee. Centrally located among surrounding shops, we are conveniently located to Drop & Shop and provide for our customers a spacious lounge with a play area for kids. What makes us different? We offer all the express services the other washes around town offer, but we don’t stop there. We offer interior cleanings, detailing services, and can wash most specialty vehicles. Here are just a few of the services that set us apart.